Russian Grandmaster Vladimir Fedoseev burst onto the chess scene when he became a Grandmaster at the age of 16 and hasn’t looked back. Placing well in multiple tournaments since then, this young prodigy has rocketed his way to the top of the world junior rankings, peaking at number 4. Always playing interesting games, this young Grandmaster has recently achieved his best rating and is sure to continue being a force to reckon with as he charges toward the elite super-GMs that are near in his sights. Vladimir Fedoseev was born in Russia in 1995. He became a FIDE Master in 2008, an International Master in 2010. In the same year that he became an International Master, he tied for second place with many Grandmasters at the Chigorin Memorial. In the next year, 2011, he became a Grandmaster at the age of 16. In 2011 he had many good performances in tournaments, both individual and team events. He came in second place at the 2011 U-18 World Championship and also won the silver medal on board 2 for the Russian team who won the gold medal at the World Youth U-16 Olympiad. In 2011 he also tied for fourth place at the Higher League of the Russian Chess Championship. 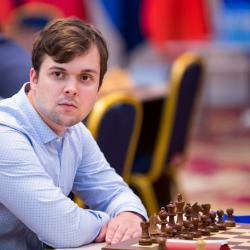 In 2012, Fedoseev scored a respectable 5.5/9 score against 9 Grandmaster opponents at the Aeroflot Open. In 2013, he was the clear winner of the European U-18 Championship. Recently he has ascended to become the fourth highest rated junior player in the world with a rating of 2668. As he continues to improve, we will be seeing more of this young, talented player in the future.